At the end of the video came the twist, with shots of Ireland's Grand Slam in 2009. The message from Schmidt was clear: there's something obvious missing from their list of achievements. A few months later, they got their Grand Slam. This has been an odd Six Nations. If we could have pressed fast-forward after Ireland's win over New Zealand last November and gone straight to the Rugby World Cup, there might have been a scramble for the remote. Because of Ireland's form and ranking, there has never been an impatience for a World Cup like this year's edition in Japan. When England cut Ireland down in the manner they did on the opening weekend in February, no wonder the Ireland players struggled to find their way. As that old Japanese proverb says: a proposal without patience breaks its own heart. Something did break, with Schmidt conceding the squad was "a bit broken" after that England hiding. We should have seen that backlash from England coming, of course, and not just when we heard rumblings in the tunnel on matchday that the England team bus was forced to wait for Ireland to arrive before they could get into the Aviva stadium. Eddie Jones warned us in November. England seemed to have that same impatience to play Ireland again as Ireland have to play in a World Cup again. For England, it seemed personal. If Ireland had performed in Murrayfield how they performed in Rome, then this Six Nations might have fallen off a cliff. But they got the job done. Romance in Rome never felt so far away with the body language of frustration and annoyance, and that was just the Italian couple arguing outside my hotel bedroom. The redemption Ireland found against France was more about Ireland players owing it to themselves to perform than anything to do with the opposition. An easy question going into Ireland's game with Wales at the Principality Stadium is: whose need is greater? The obvious answer would appear to be Wales as they're the team with an opportunity to win a Grand Slam at home (Ireland have never won a Slam at Lansdowne Road - in 1948 it was Belfast, the Millennium Stadium in 2009 and Twickenham last year). Imagine how special it will be for the thousands of Welsh fans at their national stadium today. Sure, Ireland have a slim chance of retaining the title but, realistically, it's a real outside shot as they also need Scotland to beat England. So, Ireland need another cause because if they're to win they need to be as motivated as a team trying to win a Slam at home. Unprompted, Johnny Sexton brought up earlier this week how Ireland have stopped teams' winning runs before, like against England in 2017 and New Zealand in 2016. Wales are chasing 14 wins in a row today. "They (Wales) have eked out some results, [but] we've played well against teams that have gone on runs before, New Zealand and England," Sexton reminded us. This is where Schmidt has worked his elixir in the past. When it seems like the opposition's need should be greater, he has a knack of putting a cause before a team (and a gameplan, of course) and defying the odds. Since he took over, Ireland have never lost the final game of a Six Nations campaign. In two of those championships, Ireland weren't in the running for the title. After their 35-25 win over Scotland at the Aviva Stadium on the final day of the 2016 Six Nations, Schmidt said: "that's three Six Nations we've gone through and we haven't lost at home. We take some pride in that." After ending England's Grand Slam bid at the Aviva Stadium in 2017 with a 13-9 win, Peter O'Mahony said: "Fellas showing up for each other and fellas showing up for what is special to them, not just on the pitch but off it as well. It was a great performance. (Losing to Wales) broke our hearts really." That Wales defeat that "broke our hearts" came the previous weekend. There will be squad motivation and personal motivation today. Let's take O'Mahony, for example. He's never really spoken about it publicly but it can't have been easy for the Munster captain when Warren Gatland dropped him from the Lions squad for the second test against New Zealand in 2017 after he captained the Lions against the Maoris and for the first test. "Peter was pretty quiet against the Maoris. People who know him were surprised he wasn't more vocal. Whether it was captaining the Lions or the occasion, I don't know," Gatland said in his book 'In the Line of Fire'. Since that Lions tour, O'Mahony has taken his game to another level. "Probably since the Lions he's really pushed his game on," Niall Scannell said about his Munster team-mate after O'Mahony's outstanding performance in Ireland's win over the All Blacks last November. Don't expect O'Mahony to be "quiet" against Warren's Wales today. As well as it being Rory Best's last Six Nations game, it couldn't have been set up better for Schmidt's last Six Nations game as there is an opportunity to fill a void as he's never led Ireland to a Six Nations win over Wales in Cardiff, losing there in 2015 and 2017. There was a notable change in Schmidt's demeanour once Ireland beat Wales at the Aviva Stadium last year to keep their Slam on track, as if he knew they were the team to get over. Former Leinster and Ireland player Luke Fitzgerald said recently that he believes Gatland annoys Schmidt. 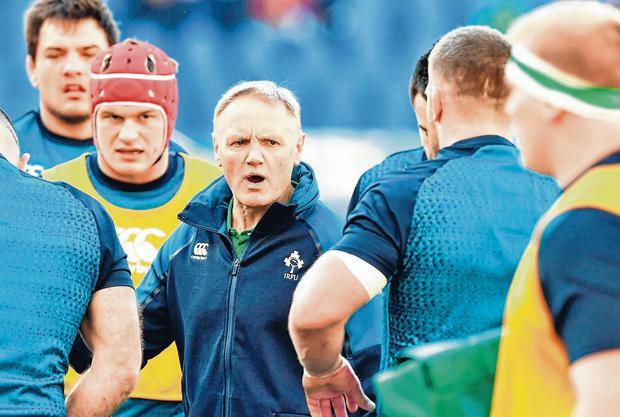 "Warren is a deep thinker and I know for a fact he's the only coach that gets under Joe Schmidt's skin," Fitzgerald said on the Left Wing podcast. "That Warren Gatland thing has been going on for a while. Whether he wants to prove himself against him, there's a battle within a battle." All over the Principality stadium today there will be battles within the battle. Gatland has pointed out before that it is part of the New Zealand psyche to attack the strengths of the opposition. Hammer the hammer. Schmidt knows that. He won't need a video with shots of Ireland's win from 2013 to remind the players what's missing from their list of achievements. Today will be sport at its engrossing best because it will be personal.